Yesterday something wonderful happened…the DLC for DeathSpank was announced! DeathSpank: Thongs of Virtue, will be the follow-up to the delightfully twisted and fiendishly addictive action RPG, DeathSpank. Featuring the trademark humor found in the original, Thongs of Virtue centers on DeathSpank’s journey through a massive war-torn land; explore the North Pole and the high seas to locate six mystical thongs to bring peace and harmony to the universe. 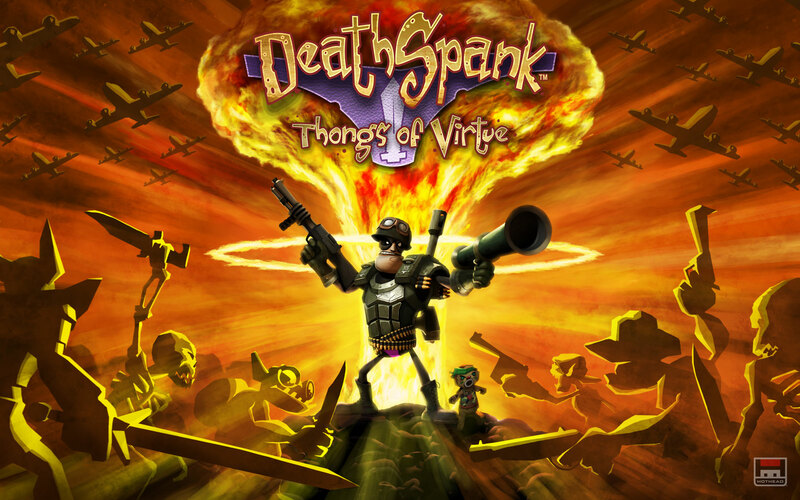 DeathSpank: Thongs of Virtue (T.O.V.) 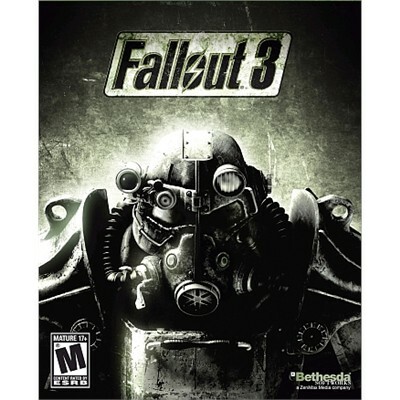 will be available for download on PlayStation®Network on September 21, 2010 for $14.99 and Xbox LIVE® Arcade on September 22, 2010 for 1200 Microsoft Points. DeathSpank: T.O.V. 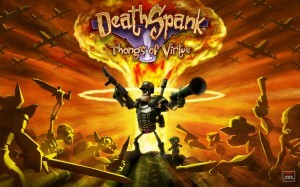 puts players in the mighty boots of DeathSpank, the “Dispenser of Justice”, “Vanquisher of Evil” and “Hero to the Downtrodden.” A long time ago, nine mystical thongs were planned to bring balance and harmony to the universe, but when marketing got in the way, only six thongs were produced, and the result was disastrous. Granting great power to those who wear them, the thongs corrupted all those they touched–except DeathSpank. DeathSpank must find all six thongs and destroy them once and for all. Thongs of Virtue includes local co-op mode, allowing a second player to choose one of two hilarious sidekicks to help save the world. Players will enjoy unleashing magical skills, playing as Sparkles the Wizard, or laugh at the ninjatastic Kung Fu moves of DeathSpank’s new partner in crime, Steve. For more information on DeathSpank: Thongs of Virtue, visit www.deathspank.com or follow the development team on Facebook at http://www.facebook.com/deathspank. In this week’s episode we are discussing StarCraft 2, Kane & Lynch 2, Rachet & Clank: A Crack In Time and a new iPhone game from listener CeeCee. StarCraft2 Articles for Noobs –10 Noob tips , Learning your hotkeys and 10 reasons why StarCraft 2 will completely take over your life. From the New York Times Play Foldit and help science! Thanks Starman for the awesome classic video game iPhone wallpapers! We talk about why female heroes were dropped from a game at Activision. RDR first pay DLC is releasing Aug 10th called Legends & Killers! No new CO-OP in this DLC (which is what I’m playing lately) – it’s all multiplayer additions including Escalera town fighting and Tall Trees snowy area. Repentance Rock showcases the new weapon, the tomahawk which allows you to stay hidden on the map while you take down an opponent. A wonderful puzzle adventure game called Machinarium is 75% off till Aug 12 ($5!!!) Get it! Listener CeeCee sent in an iphone/ipad recommendation called Arachnophilia, you play as a spider building a web to catch bugs. Steph downloaded HighbornHD for the ipad. It’s a turn based game with a lot of the humor of Deathspank. Very clean graphics. $2.99 during initial release. Not much news in WoW this week, but we discuss how to keep the game fresh while waiting for the expansion. The answer for last weeks video game quiz was Batman: Arkham Asylum and our winner of the VIP DUCO Beta Key is Chris! Congrats Chris!!! Nicole, Kim & Stephanie will be giving out LoL stickers (thanks StickyLife!) at DragonCon in September, but if you can’t make it, you can also buy them at Nicole & Marc’s store they set up for their other site The Wood Whisperer. Check outStickyLife if you are looking to get your very own awesome stickers made. Use the discount code LADIESOFLEET and you will get 25% off your entire order! 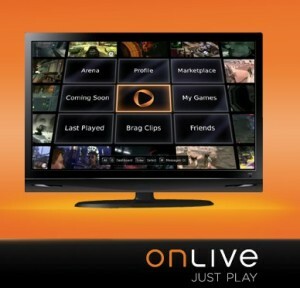 As mentioned in Episode 23 of LoL we received a great individual review from robodude666 about the new service OnLive. Instead of trying to cram his review into the show I felt it would be nice to create it as a separate post for those interested in the service. After signing up, OnLive is downloaded as a small ~30MB application which gives you the ability to login, and it’s where virtually everything happens. The interface is a very console-like with 9 rectangular buttons aligned in a grid. They give you the ability to browse games, view other people play, view recently played games, profiles, change your settings, etc. The game list is just a huge list of games, and actually isn’t all that huge. There are about 10-15 titles, though there are a few big titles like Assassin’s Creed II, Mass Effect II, Splinter Cell, Dragon Age, etc. I tested the service using Assassin’s Creed II and Splinter Cell. Mass Effect II wasn’t available on the Mac OS X OnLive client (lame! ), though I would have happily tried it as well. Everyone is probably wondering, how is the visual quality? Horrible. You’re basically playing pixelated pirated/flash-like quality video that has interactive controls. In fact, it seems that the games on OnLive are all special builds as none of them have a Video or Graphics section in the settings. I played Assassin’s Creed I on my gaming PC when it was released with a fairly high-end DirectX 10 card and it looked stunning. Playing Assassin’s Creed II on OnLive was like watching a YouTube video 2 or 3 years ago. The lag made timing jumps very difficult sometimes, and if the lag was too severe OnLive would simply disconnect you without giving you a chance to save. I tested the service with a pretty decent 15Mbps down, 3Mbps up cable connection and live in NYC. I can stream HD video from hulu, the olympics, and youtube without much problem. OnLive, however often said my connection was not good enough and locked me out of the service until my connection improved. During these occurrences (normally after 5PM), SpeedTest.net said I was getting about 8-10Mbps down. Logging in and Playing at 8AM to 1PM was no problem. So, if you’re on a so-so connection you may find trouble logging in if your ISP’s network is saturated by other clients. Now, while the service is not all that beautiful, the demo system is very well through out. You can demo virtually any game and get 30-35 minutes of play time — from the start of the ACTUAL game. This is actually quite cool as most PC games don’t ship a demo out, or when they do have a demo released the demo only covers one cool actiony sequence that might have been the only fun part of the game. So, because you don’t have to download gigabytes of demo like you traditionally would this works out very well. You can try a game before buying it (though I recommend buying it outside of OnLive). Games can be played by purchasing a “Pass” for them. Passes can include a lifetime pass, or a short period aka rental pass. These can range from nearly full retail price to only a few bucks for a few days of access, which is quite cool. Some games aren’t worth owning, but being able to play them for a day or two is great. The Bottom Line? OnLive needs some more work. A subscription-based model for crappy Flash-like pixelated quality video is not worth it — especially as you have to also BUY the game. In closing, OnLive can be a great GameFly-like service for PC gamers, who can’t afford a console or aren’t comfortable with Analog Controls. It’s just not there yet. If you can get a hold of a 1-year free account OnLive is offering, it’s definitely worth checking out. Even if you don’t fall in love with the service, it’s a good way of demoing games or playing the full game for a day or two instantly. I wouldn’t use it as a primary way of gaming though. Consoles and decent gaming PC hardware is affordable these days, plus the release of Steam for the Mac solves that issue. Again thanks Robodude for sharing your experiences with all of us!! !